Can Beginners Build an FPV Mini Quad? There are pre-built drones you can buy off the shelf, but you are not going to learn anything. By building a quadcopter, you know exactly how everything fits together and how to repair it later on. It’s going to be hard building your first drone, it could take hours, or even days to finish. When you encounter a problem, you might take advice from experienced pilots, or ultimately end up finding your way by trial and error. Either way, the journey is going to be extremely rewarding. I wrote this tutorial back in 2017, and I have been constantly updating it to cover as much detail as possible, while trying to keep it simple so any beginners can easily follow. My goal is to teach you the steps and basic knowledge of building and setting up a mini quad. There are a million ways to build a mini quad, different builders might use different steps, tools and techniques. But the goal is the same – building a racing drone that is reliable! And don’t be afraid to do things differently, as long as it works for you. if you see an abbreviation and have no idea what it means, you can try looking it up here: Acronyms and technical terms in FPV. For this tutorial, I will be using the following parts in “Primary Options” column. I also listed alternatives. The Martian II frame is a great value frame. I am still flying the one I bought back in 2016, the oldest frame in my fleet. It’s very roomy and easy to build, you can’t go wrong with the Martian II as your first mini quad frame. By the way, I have a coupon here, FiberRC, you can get the Martian on this page for only $16.8. Expires in June 2019. I like the simplicity of “AIO” (All in one) flight controllers, it combines the FC and PDB into one single board, which minimizes the amount of wiring and soldering. The Kakute F7 AIO FC has been one of the most reliable flight controllers for me. You don’t need to worry about soft mounting because the Gyro is separated from the board by vibration damping foam. It features a powerful F7 processor that allows you to run all the latest features in Betaflight and still has enough processing power to run fast looptime. The DYS Sunfun 2207 2400KV motor is one of the best value motors I’ve tested. FPV Beginners are going to crash a lot, and motors take the most impact so if you break them it won’t hurt as much. As your first build, I would steer away from 4-in-1 ESC’s. They might be easier to work with, but if you burn out one ESC then you are screwed. It stinks that you have to replace the whole board. That’s why it’s better to use standalone ESC’s, price difference is minimal anyway. My go-to standalone single ESC’s right now are the Tekko32 35A. They are BLHeli_32 ESC’s, capable of running 48KHz PWM frequency and DShot1200, making them more superior than the older BLHeli_S ESC in terms of performance. Your choice of radio transmitter determines what receiver (RX) you are going to use. For Frsky Taranis users, both the XSR and R-XSR are excellent choices. XSR and R-XSR have the same features and range, but the R-XSR is smaller and lighter. Size is really not an issue for the roomy Martian frame, so you might want to consider the XSR because it’s slightly cheaper than the R-XSR. Anyway, it really doesn’t matter. 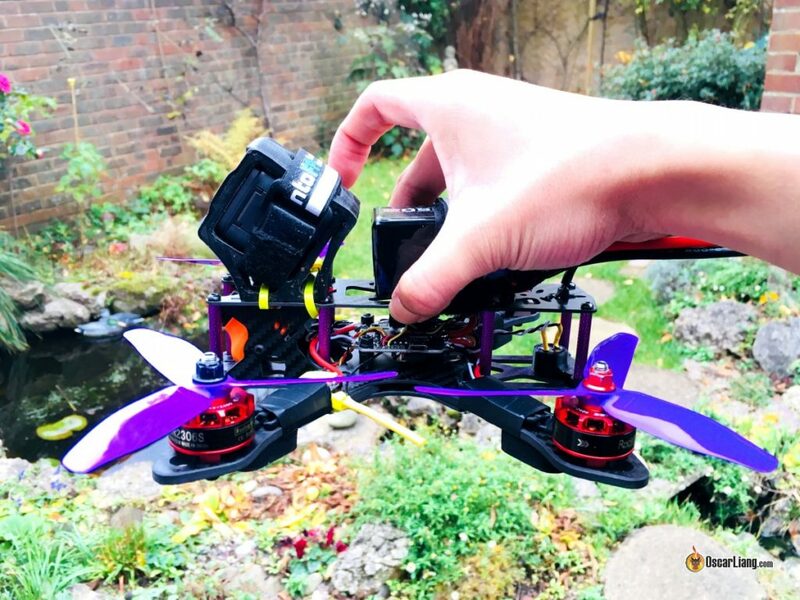 I am using the Eachine TX805 VTX in this build, simply because it’s cheap and has got all the features I ever need in a VTX! It has SmartAudio, selectable power levels range from 25mW to 800mW, MMCX connector, and a built-in Mic. The Runcam Eagle 2 is simply the best “All-Around” FPV ever made, excellent performance in both day and low light. They also make a smaller version, the Micro Eagle. But yes, the Martian only takes full size cameras, but you can get this adapter so you can mount a micro camera just like a full size camera. There are cheaper FPV cameras, but being able to see well in your FPV goggles makes a huge difference in your confidence and how well you can fly. Most racing drone propellers these days are made of Polycarbonate plastic, which means they last much longer! My personal favourite props for this build are the DAL Cyclone 5045×3, and HQ 5.1×4.1×3. Get whichever prop you can find. You will also need to have the following accessories in order to fly a quadcopter. If you don’t already have these, take a look at my shopping guides to get some ideas what to buy. A Radio Transmitter for controlling the drone, here is my Buyer’s Guide. My recommendations right now (2019) are the Jumper T16, Taranis QX7 and Taranis X9D. A pair of FPV Goggles for watching real-time video from the drone, here is my Buyer’s Guide. My recommendations (2019) are the Skyzone Sky03, or the Fatshark HDO with Pro58 Module. Some 4S 1300mAh or 1500mAh LiPo Batteries. There are quite a lot to learn about LiPo in this Buyer’s Guide, because if you don’t handle them carefully they can be dangerous. See this post for our LiPo Recommendations. Finally, you need a battery charger, you can learn about the specs in our Buyer’s Guide. And here is our LiPo charger recommendations. See this article for an up-to-date list of gear and equipment that I use. These are the basic tools for building a drone. You might already have some of these tools lying around in the toolbox. If not, you should get them, these tools will come in handy for repairing and building your next quadcopter. Here are the steps, click the link will take you to that part of the article. Assemble the frame by installing the arms, bottom plates, long aluminium standoffs and nylon standoffs for the FC. You can now mount the motors to the arms. It’s recommended to use loctite (thread lock) on motor screws. That’s because motors make vibrations and there is a chance those screws can wiggle free over time. Make sure motor screws do not touch motor winding – here is how to check if your motor screws are too long. There is no need to use washers. Think about how you are going to connect all the components, draw the plan on a piece of paper. If you are using the components I recommended, here is a wiring diagram you can follow. You can then try to “dry fit” all the components in the frame – install them in the frame without actually connecting or soldering anything. This allows you to visualize how and where everything should be mounted, and spot any potential issues with space and mounting. You can also see roughly how long the wires have to be. For example, check if the FPV camera cable is long enough to reach the “Video Input” solder pad on the flight controller. You are about to do some soldering, if you are new to it, please see my tutorial on How to Solder for Beginners. From the “dry fit”, we know where we will be mounting the ESC on the arms, and how long the motor wires have to be. So you can cut motor wires to length (leaving a tiny bit of stack), strip the wires (around 2mm) and tin the ends. Before installing the ESC, put electrical tape on the arm for insulation. Remember, carbon fibre is conductive, and the Tekko32 ESC doesn’t come with heatshrink. If your ESC have heatshrink then you don’t need the electrical tape. On top of electrical tape, put a strip of double-sided foam tape for sticking the ESC to the arm. Install the ESC on the arm, tin the solder pads and solder the motor wires on. Don’t worry about wire order and motor direction, we can change it later in the software (BLHeliSuite). Then solder the power wires and signal wires to the ESC. The Tekko32 ESC’s come with these wires, the power wires are 18AWG (red & black), while the signal and telemetry wires are 24AWG (white & blue). Color doesn’t really matter, it just makes it easier to tell what is what. I am not soldering the signal ground wires on the ESC, because there isn’t a signal ground pad on the FC. But if you really want, you can solder it to the power ground pad on the FC. In my opinion, it shouldn’t be much a problem without it, because the signal wires are going to be very short. This is what it looks like when ESC’s are all mounted on. In this build, I decided to mount the radio receiver (RX) under the FC. Because of this, I had to replace the original standoffs (6mm long) with some slightly longer ones (10mm long). You’d have to purchase these 10mm standoffs separately as they are not included in the kit. If you don’t want to change out the nylon standoffs, you can just mount the RX somewhere else in the frame. There is so much free space! Install the flight controller on the nylon standoffs, make sure the arrow on the board is pointing forward. Cut the ESC wires to suitable lengths. Shorter is better as it minimizes resistance in the wire and less likely to pick up interference. But it’s good to leave some slack so it doesn’t stress the solder joints. Slack in the ESC wires can also maximize the effectiveness of the FC/Gyro soft mounting. If wires are too tight it will transfer more vibration to the FC from the frame. Before soldering ESC wires to the FC, I strongly recommend covering the FC with some tape on areas you are not working on, so you don’t accidentally drop solder on the board which could ruin your FC forever. Tin all the solder pads you are going to use on the FC. Skip the ones you don’t use. Use solder flux as it helps soldering big wires tremendously! And apply a decent amount of solder at the same time, the solder joint will look shiny, round and solid! Here is an example. Good work takes time! Don’t rush it. You can now solder the XT60 pigtail to the FC as well. The wire length really depends on how you are going to mount the XT60 pigtail in the frame. Check mine later in the build log for ideas. Personally, I normally make sure it’s just long enough to stick out of the frame. My XT60 pigtail is about 8cm to 9cm long. Watch out for polarity (positive and negative wires). I also recommend soldering a low ESR capacitor at the power (on the same pads as the XT60). See this post to learn why adding capacitors to mini quad. In a nutshell, when you have very noisy gyro or FPV video, the capacitor will help “clean up” the noise coming from ESC and motors. Even if your mini quad is “super clean”, when you have a bent prop you will start to get noise from motors, and a capacitor can have you covered in these situations. You can mount it however you like. I normally just stick it on the bottom plate with some double-sided foam tape, then zip tie it to the standoff. Time to test our motors, which means we will be plugging in LiPo battery for the first time! For safety, you should check continuity first to ensure there is no electrical short. You can do this with a multimeter: put it on continuity mode and touch on the positive and negative XT60 connections with the probes. Here is a quick tutorial on what multimeter you should get, and how to test your drone with it. If there is a short circuit, the multimeter will start beeping non-stop. If this happens, you need to find out what is causing the short and fix it. One common cause would be excessive solder connecting pads next to each other and so this will need to be removed. Pro-Tip: sometimes the meter might beep for a split second then stop. That’s because there are capacitors between positive and negative. When you touch the pads with your probes, it charges the caps up so the meter thinks there is a short, but when the caps are charged the beep will stop. That’s normal and nothing to worry about, it should be fine if the meter doesn’t continue to beep. For the first time you plug in the battery, use a smoke stopper. You can build yourself a smoke stopper. This is a great and simple device to avoid magic smoke! You can also just buy one but it’s not as effective as the light bulb version. You don’t have to use a smoke stopper, it’s just something I would strongly recommend. If you don’t have it, check with a multimeter at the very least. Now you can plug in the battery, go to the Motor tab in Betaflight Configurator, and try to spin up the motors one by one, and verify if the motors are spinning the right direction (instructions). If it’s spinning the wrong direction, then you’d have to reverse it. 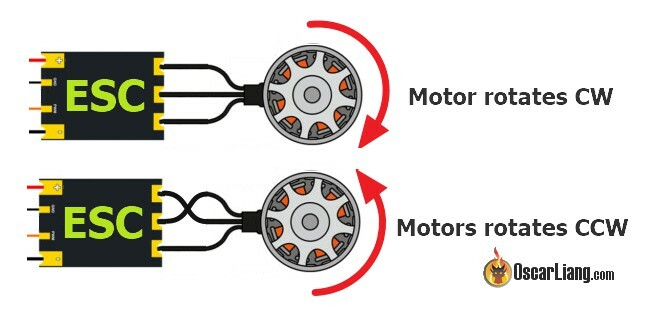 There are two ways to reverse a motor direction. Firstly, you can swap two of the motor wires around. Here are instructions on how to connect your BLHeli_32 ESC’s to BLHeliSuite. While we are at it, you can also adjust ESC settings to optimize performance. The two settings i always change are PWM frequency (to 48KHz), and Motor timing (to Auto). 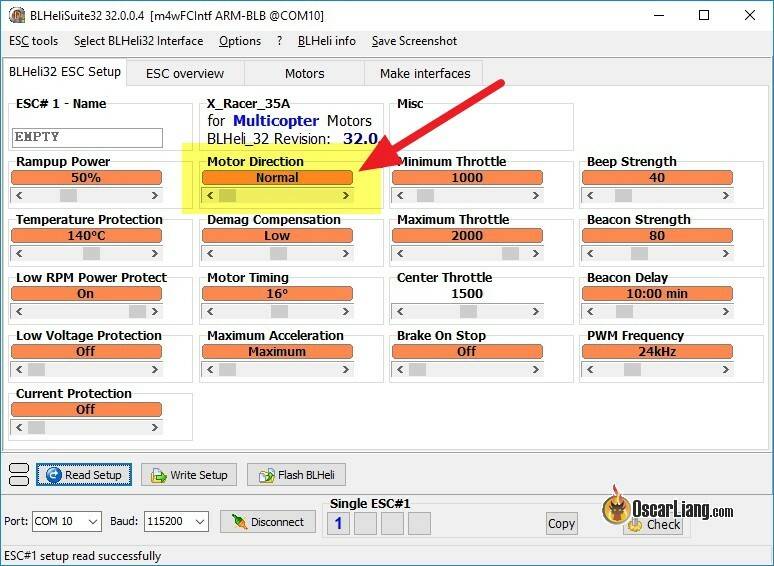 See this post to learn about BLHeli_32 ESC Settings. Did something go wrong? Here are some troubleshooting tips. Motors are not spinning at all? Did you connect the battery? If so, did you hear the ESC beeps as you plug in the battery? Are the ESC signal wire soldered to the correct pads on the flight controller? And And check motor wire soldering. If one motor still isn’t spinning after checking everything, it’s possible that the ESC or that motor is faulty. You can try swapping this motor with another working one on the same quad, it will help rule out whether it’s the faulty ESC or motor. After confirming the motors, ESC and FC are working, we can now move on to soldering the radio receiver to the flight controller. With the receiver connected, the next step is to bind it to the Taranis transmitter (instructions). In the Ports tab in Betaflight configurator, enable “Serial RX” under UART4, and select “SmartPort” under UART6. Then go to the configuration tab, under “Receiver” section, select “Serial-based receiver”, and choose “SBUS” as the provider. Once that’s done, you want to confirm the receiver is fully working in the Receiver tab. When you move the transmitter sticks, the bars (channels) should move as well. If the wrong channels are responding, try a different channel map, it’s normally either “default (AETR)”, or TAER. You will need to setup at least two switches on the Taranis (instruction) for arming and enabling “lost model beeper”. Again, confirm it’s working in the receiver tab, these should show up as channels AUX1 and AUX2. Next you want to test if SmartPort is working. You can do this by simplying go to the telemetry page on the Taranis. plug in the LiPo, and the LiPo voltage should be displayed under “VFAS”. If you don’t see “VFAS”, then scroll down and select “Discover new sensors…”. And finally setup and test failsafe (instruction) on the receiver. Let’s move on to our FPV system. Solder both cables from the VTX and FPV Camera to the flight controller. I am powering the VTX directly from LiPo voltage (BAT), and the camera from 5V. SmartAudio from VTX is connected to TX1. Pro tip – twisting cables this is a great way to help reduce unwanted RF noise. Power on the quad with Smoke Stopper, to test make sure you are getting a clear picture on your goggles. Since the VTX is brand new, it could be on any channel. Use the “search feature” on your FPV goggles to find it, or simply scroll through all channels. Here are instructions on how to setup SmartAudio so you can change VTX settings in Betaflight OSD. Solder the buzzer to the FC: Buzzer positive goes to 5V, Buzzer negative goes to Z-. To mount the buzzer in the frame, you can use the same trick we used on the capacitor earlier – double-sided foam tape :) Don’t block the hole though! Stick it to the frame, then wrap around it to a standoff with electrical tape . Most things are open source in the FPV hobby, including 3D printed parts for our quads! You can find lots of useful 3D printed part designs online. While 3D printed parts are not necessary, they can be very useful. I designed these 3D printed parts specifically for the Martian II frame, they make the build so much cleaner! If you don’t have a 3D printer, I can print and send them to you, get them here. The XSR and R-XSR receiver have two antennas for diversity. For the best result, keep the two antennas at roughly 90 degree. Here is a trick for mounting your RX antennas: you can wrap a zip-tie around the arms, then use heatshrink tube to affix the antenna to the zip-ties to keep it away from spinning propellers. Another useful trick is adding some covers to your ESC’s using plastic sheets. This will prevent “prop strike”, where spinning propellers get bent and hit the ESC in crashes. Here is how the quad looks like so far. We can now put the top plate on. I am installing an HD camera mount on top of the frame for my GoPro Session. The camera mount is 3D printed in TPU. If you don’t have one you can ignore it. For mounting the battery, I am using a IntoFPV battery strap, and Ummagrip battery pad. I really like the Ummagrip, it keeps your battery safely away from the bolts, and it sticks to the battery really well. Alternatively you can just use the good old velcro. When mounting battery, make sure the centre of gravity is as close to the centre of the drone as possible. To check if you have placed the battery at the right spot, simply grab the middle of the top plate with 2 fingers as shown in the following photo, and the quad should stay level. It’s important to make sure the COG (centre of gravity) right at the centre of four motors. If the quad is back heavy for example, the rear motors will have to work harder than the front motors in order to maintain balance, and this will impact flight performance. The XT60 pigtail is held in place by a 3D printed mount I personally designed. A very neat and practical solution. If you don’t have 3D printed part, you can simply strap it to the top plate like so with a heavy duty zip tie. (make sure you’ve chamfered the edge of the top plate). It’s not very pretty, the goal is to keep your battery lead away from spinning propellers. Pro Tip: Don’t leave the battery balance lead hanging around, it can get chopped up by propellers. I usually put a rubber band on the battery to hold the balance lead in place. 14. Racing Drone Build Finished! Finally, it’s done! Now attach the propellers. Be aware of the different CW and CCW propellers and install them in the correct motors. Otherwise your quad is going to flip over when taking off. The quad weighs 350g, without Battery and HD camera. 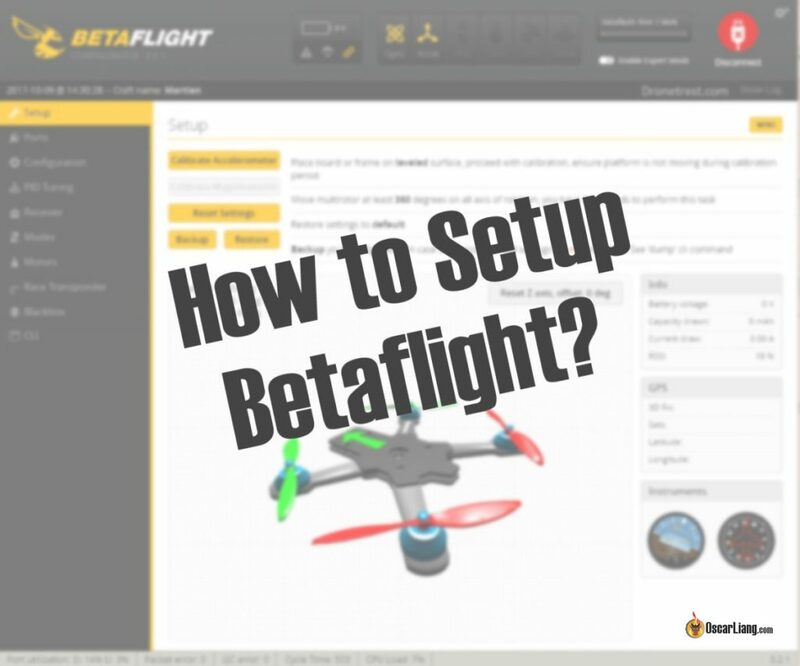 To setup Betaflight for your first flight, follow the instructions in this guide “how to setup Betaflight for the first time“. You might have your own preference about PID and Rate/Expo, but if you have no idea where to start, you can try my personal preference. [Updating… ] I will be testing Betaflight 4.0. Will come back and update my settings here soon. Here are some other videos with the Martian frame. Looking for more examples and inspiration? Here are some of my latest builds and parts list. Funny story, 1 month ago I stumbled upon this guide, and ordered the parts. Some of the parts already arrived but you completely changed the guide! Shock. Thank you so much for all your work, you made me found my new passion and it wouldn’t happen without you. Oscar, thanks. I only got interested in drone because of my grand daughter. I wanted her to be acquainted with this new skill which I think will b just like driving n typing skill in the future. Of course the fun element is tremendous. So I got involved about 4 months ago and was kind of hooked. I have played around with a variety of them and lost a number. The Chinese cheaper ones, the Tello, the micros and am trying to control the Mantis 85 (too fast). My aim is to eventually get to a proficiency level in FPA flying. I got most of my knowledge on this subject from your site. I am now into building my own drone by following exactly your recommendations. I have got all the parts today and will take my time to build it carefully with your guidance here. I hope things turn out smoothly but should I encounter any difficulty which has not been already covered here, I hope u don’t mind me asking u for help. Thanks again. I am actually in the process of updating this guide, it’s taking me a few weeks but I am getting there now. Feel free to join our forum (intofpv.com) it’s a great community! I am trying to help my 12 yo son build his first quad. We use the Omnibus F4 Fireworks FC, Racestar 30 A ESC, Racestar 2306 2700 KV motors, and FrSky R XSR receiver. We have the quad configured in Betaflight. When we try to raise the throttle on both the Taranis and in Betaflight using the motor slider, the motors stop spinning when the throttle is half way up. Any ideas on what might be the problem? I assume you don’t have props mounting on it? What ESC protocol were you using? Try something slower like Oneshot125? 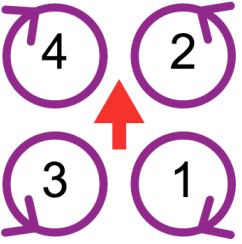 Best How To I’ve seen, and I had hopes that this one would at last define the motor positional configuration (map). Not icing on the cake, but mportant info. I’ve come accross different versions, including one configuration I’ve never seen before. This question might sound stupid but I’ve seen on the build plan that there is no white wire on the reviewer but there is on the picture on banggood. Do I cut or desolder this wire? And are there any recommendations for a cheap beginner frsky transmitter? Ignore the wire color, and find out what the wire is? There are 4 connection you need for the receiver, ground, 5V, SBUS and SmartPort. There shouldn’t be any other wires. Ants_SA here, thanks for the great article. Your site and form are now my go to page for research and ideas for fpv. As I have mentioned before I am totally new to this…in fact so new that I own absolutely nothing yet BUT I am getting to the point where I want to start purchasing items for my first build. I want to follow a lot of what you have done here in this build but what I do want to do is more long range flying initially. What recommendations/changes would you suggest to this build keeping as much as possible the same? Hello Oscar! This is an excellent walk through on building a drone. I am completely new to the drone scene and would like to build my own drone. This website has been very useful. I made my own list of parts in Banggood.com that’s fairly close to the parts you mentioned here on this website. Can you tell me if all the parts are compatible with each other? If I need to add anything? I tried to go the absolute cheapest route possible. I just realized the link did not post. Here is the list of parts I made if you or someone wouldn’t mind telling me if they are all compatible with each other. sorry for the late reply, I spend most free time on the forum (intoFPV.com), and only check comments once a week. Trying to a run cam split 2 with the omnibus sip and xsr frsky receiver. I was attempting to use rx 3 and tx 3. In order to control it from qx7. Is there a known guide somewhere? Thanks for great tutorial. Hi Oscar, as an alternative to the Eachine VTX03 you suggest the Matek one. But the F4 AIO has only 5v output and the Matek support only 7-27v input. How can it be powered with this FC? Thanks for your attention! What battery should i get for this particular build? lipo battery topic is a bit confusing for beginners. However, I’m confused with the wiring diagram for the Omnibus F4 AIO and FrSky XSR. The XSR has 5 wires, one being a white wire. The white wire doesn’t appear on the diagram, unless it can’t be seen due to the white background. I’ve searched the web for any clues, but can’t find the answer. Please can you advise where the white wire should be connected. Other than that, your tutorial is excellent and prompted me to have a go. There are only 4 connections from the receiver to the flight controller, 5V, GND, SBUS and SmartPort. The “white” wire you refer to is not connected. I was thinking that was the case, but it’s nice for it to be confirmed. I’ll finish the build, in slow time; I seem to spend too mush time flying the fixed wing. The next step ‘ll be the Betaflight set-up; you make it look quite simple, so I’m looking forward to my first hovering practice. Thanks again for providing so much information on your website; it’s an excellent source for guys like me. Do you have any thoughts on possible fixes? I don’t really see how you are connecting everything in your post, so here are the things you can check. If you are using PPM, you should connect PPM from your converter to the PPM pin on the FC. Feed the PPM converter 5V and ground, and your RX should get the 5V from the converter. The setup in Betaflight is different for PPM, you just need to select PPM in the receiver option in the configuration tab. Many thanks Oscar. I found what was causing issues in my earlier post, and that was a faulty PPM encoder. With that fixed, I do now have 5v, PPM and ground going to the encoder (flashing blue light on the encoder), and with 5v, ground, and 8 channels (1-8 in the top row if the Turnigy receiver) going to the receiver. I have successfully bound the receiver to the transmitter (steady red light on the receiver), and selected PPM in the configuration tab. However, adjusting the transmitter controls does not seem to be making it through show in Betaflight. Thanks again for your help. I’m new to all this, and encountering more problems than I was expected. All good for the learning curve though. Sorry to bother you I have tried everything but i cannot make the telemetry work. so you are using soft serial for SmartPort? have you tried setting tlm_inverted to off? Yes. I use soft serial and tlm_inverted. Does order in setting up matter? I tried everything a couple times. Resetting to factory and flashing firmware to start over. Is there a way to check signal? The xsr works, it gives me basic metrics incl an A2. Where that comes from i don’t know. I thought i added the dump. However it is not showing in the comment. Would that give you pointers? Yes please. I don’t monitor blog comments very often. I could post it in intofpv if you like this thread to stay clean. I can’t wait for the second run! She seems to fly really well! Thank you for the tutorial! Completed the build. One thing I’ve observe though when I try hovering is that without any (yaw) input quad turns clock wise slowly I assume motor momentum is not fully balanced, could you please advise on how to balance motors ? Can you check in receiver tab in Betaflight configurator, if Yaw channel is centered? build complete, even the programming phase. Only one problem: I see that when I test the motors the bottom plate of the frame gets hot, especially the screws (they are almost untouchables). This happens after some seconds (maybe ten) at full throttle. Is this a normal thing or the temperature on the frame is supposed to be much lower? motors and esc doesn’t seem to get hot anyway. Thanks for your advices. Do you have your VTX mounted on the bottom plate? Also check if your motors are getting hot? Yes that’s a comment beginner error, take a look at my article how to prevent this in the future. 1. I’ve assigned B06 to SERIAL_TX 11, before it was used by LED_STRIP 1, and I also freed LED_STRIP 1 as below, is this (below) resource allocation correct? 2. There are 2 red LEDs on FC – one on each side, is this OK? Sorry forgot to mention that I use OMNIBUS F4 AIO and FrSky XSR. I don’t see anything wrong. Just try it. Hi Oscar, I finished building the mini quad and now I’m in the programming phase. Yes you have to remap the LED strip pin to soft serial TX1. I do not have the opportunity to choose between CW and CCW when buying the 2207’s. Doesn’t this apply for this motor? Okay, so it doesn’t matter? The nut can’t unscrew itself? as long as you tighten them properly they shouldn’t come loose. I’ve picked motor – T-Motor F40 III/2600kv and props – DAL Cyclone T5045C so if I understand correctly for this combination max current is 40.92A * 4 = 163.7A and burst C=163.7A/1.5Ah=109 and continuos Cb/2=54.5 so am I correct that Infinity Graphene 4S/1500mah 70C will work well? Motor Amp draw is much smaller in real life, maybe 20 to 30% less. Besides you probably don’t hold your throttle at 100% for longer than a few seconds. I think your max current draw would probably be about 30×4 = 120A. But to your question, 1500mah 70C would be fine! sorry…I just figured it out reading better the article!! Sorry for the late reply i have way too many comments on the blog lol. i need to build lisam 210 drone..plz need help…this is the best web site to learn..
i dont know any thing,,but likw to learn,,also like to know abour beta flight..
Hi, I am building the drone that you laid out in your page here. The problem I have is the xsr receiver hooking up to the Ominbus F4 AIO OSD board. There is no clear picture of the F4 and the frsky xsr connected. The board I bought only has two rows of pins where the one that I see everywhere is 3 pin rows. I tried soldering the jumper for uninversion, but its so delicate, one of the circuit lights fell off and I lost it. My question is, is there a reciever board that you can recommend that I can just solder the wires like a schematic shows, and not have to do a un-inversion jumper? Something that will work with the components you have outlined and works with the Taranis X9D? Thank you for any clarity on this issue, I’m a newbie and it shows, but I’ll get it. You can try getting the uninverted signal from the XSR receiver. In this article I will show you the pin you need to solder a wire to to get the uninverted SBUS and Smartport signal. Thank you for this great article. The link to “Eachine VTX03” actually leads to a “DYS MI200MW Pigtail”.